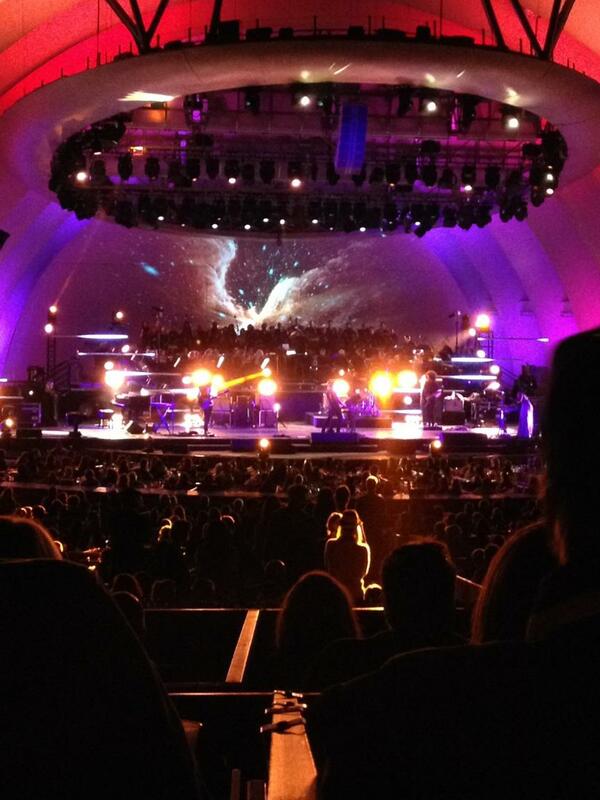 Sunday at the Hollywood Bowl wasn’t your standard, garden variety tour stop for M83. Instead, fans got a well-orchestrated and tastefully executed audiovisual spectacle of the highest caliber. The rare, yet always enthralling in-the-moment feeling that you’re witnessing something truly special (albeit fleeting) was almost immediately evoked while the Hollywood Bowl Orchestra got to work before the other touring members of M83 took to the stage. Early on, Gonzalez sheepishly and graciously acknowledged the enormity of the occasion, admitting that he was quite nervous to be leading such a lofty, one-off musical endeavor in front of a sold out audience of 17,000-plus. This special Sunday night show has been circled on the calendar and when the event finally happened, it was every bit as memorable and dare-I-say epic as I hoped it could be. Starting with the brooding and spacious “In The Cold I’m Standing,” Gonzalez appeared alone with the backing silhouetted Bowl Orchestra on a mostly dark stage, setting the tone for a downright dramatic musical and visual production that will undoubtedly end up near the top (quite possibly at #1) on my personal list of Best shows I’ve seen in 2013. Hurry Up We’re Dreaming’s “Intro” fittingly followed next, offering Gonzalez the first chance to beam out his recognizable, heavily effected and sprawling vocals. The choral outro of “Intro” with an accompanying full choir was the first of many jaw-dropping WOW moments that filled the night air. The effervescent “Reunion” marked the first full and proper M83 band tune (no orchestra) and the band laid it down with a ferocious and wide-eyed enthusiasm they hadn’t approached to this point in the show. “Sitting” was one of the few songs I didn’t recognize (and a major highlight of the set) – a driving and futuristic composition that drew comparisons to something I’d expect to hear at a Nine Inch Nails show. Stunning renditions of “Splendor” and “Wait” (replete with the return of the Hollywood Bowl Choir) set a palpable tone and ebbed the set’s energy for a few moments before the big fulcrum moment that would follow. As the orchestra took a break, Gonzalez invited the young girl Zelly Boo Meldal-Johnsen out to deliver her story on “Raconte moi Une histoire” and she absolutely nailed it, sparking a wave of roaring applause and wholesome vibrations throughout the audience. While other kids would’ve likely been terrified by such a monumental moment in their young life, Meldal-Johnsen delivered like a seasoned professional, sporting a smile the size of the Bowl shell and staying on to dance with each member of the band as it segued into the instrumental part of the song. While the majority of the show felt like a quick intergalactic jaunt out into a make-believe fantasy world, this portion made us all remember the limitless imagination and enthusiasm of a youngster. The signature bouncy synths, steady bass line and flurry of guitars were merely background music for the star of the show as Johnsen radiantly fluttered around the stage and stole the show from right under a polished orchestra and the critically-acclaimed international sensation headlining the night. 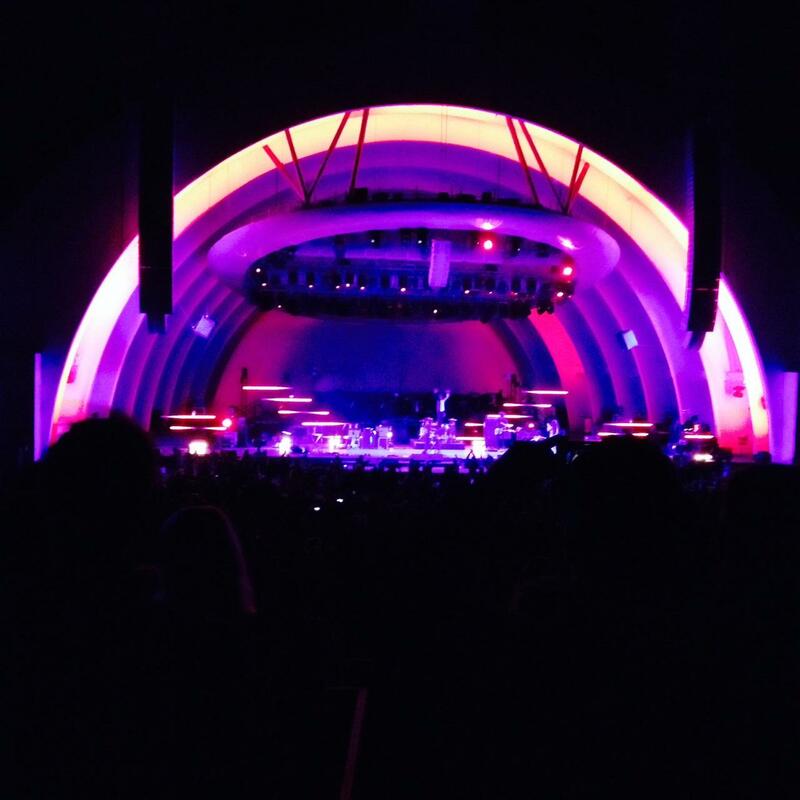 Once the highly recognizable first notes of “Midnight City” finally hit, the crowd was on their feet for the remainder of the night – no small task at the sometimes subdued Hollywood Bowl Sunday shows. The only remotely off-putting moment of the show came during “Oblivion” when the big screens showed scenes from the film of the same name and all-too-prominent shots of Tom Cruise grabbed attention away from the refined atmospherics that had fully taken hold of most everyone in attendance by then. It kinda felt like a grandiose commercial for the film. Following the brief Hollywood moment, a bright and mostly full moon had now risen high enough over the mountains behind the stage for all to see. This was almost perfectly on queue for the ethereal and inevitable “Outro” that was accompanied by a fan-made montage accenting the natural beauty of surrounding Greater Los Angeles. However, while the massively transcendent and symphonic composition would’ve suited just fine as a show closer, M83 wasn’t done just yet. To close the show, a frenzied, collective celebration of the grandiose outpouring we’d just witnessed ensued during a well-built up “Couleurs,” that put a colossal exclamation point on a meaningful and extraordinary musical exploration we were lucky enough to partake in.